The East Swamp Mennonite Church (Alliance of Mennonite Evangelical Congregations, formerly a General Conference Mennonite church in the Eastern District Conference) is located at 2405 East Swamp Road, Quakertown, Bucks County, Pennsylvania. In 1771 the Swamp congregation built a schoolhouse about a mile east of its meetinghouse. It is not known whether this school was also destroyed by fire and a second log house was built which served the double purpose of school and meetinghouse. In 1850 a brick meetinghouse was erected; in later years it was greatly enlarged and altered. From the earliest days East Swamp and West Swamp were one congregation. In 1847 under the leadership of their minister John Oberholtzer, both meetinghouses and all but a few members joined the new conference. In 1877, because of increased growth, East Swamp became a separate congregation, and in 1921 it chose its own minister. Known ministers and their terms of service up to 1950 were: Michael Musselman 1773 (? )-1790, Jacob Nold 1794-1817, Samuel Musselman 1808-1847, Christian Bliem 1814-1831, Christian Zetty 1817-1843, Jacob Hiestand 1832-1842, John H. Oberholtzer 1842-1888, William N. Shelly 1847-1858, Levi O. Shimmel 1858-1869, Andrew B. Shelly 1864-1904, Harvey Gottshall 1901-1913, Harvey Shelly and Victor Boyer supplied during 1914, Harvey G. Allebach 1915-1921, Victor Boyer, Joseph Hagenbush, Reed Landes, Grover Soldner, and Freeman Swartz supplied 1921-1925, Howard G. Nyce 1925-1929, William Rivelle supplied 1929-1930, William S. Gottshall 1930-1939, Harold Burkholder 1938-1945, Abraham H. Schultz 1945- . The Sunday school was organized in 1866 or earlier, and in 1911 a Christian Endeavor was organized. The membership in 1864 was 79, in 1902 it was 119, and in 1953 it was 196. The common names in the 1950s were Landis, Auckland, Bleam, Barndt, Shelly, Schaeffer, and Hallman. 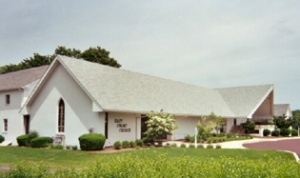 The East Swamp congregation was a charter member of the Alliance of Mennonite Evangelical Congregations (AMEC), a fellowship of congregations unhappy with some of the language in the Confession of Faith in a Mennonite Perspective approved by the Mennonite Church and the General Conference Mennonite Church in 1995. The Alliance became a separate body in 2002. "History of the Swamp Congregations." Mennonite Yearbook and Almanac (1918). Fretz, J. Herbert. "East Swamp Church (Quakertown, Pennsylvania, USA)." Global Anabaptist Mennonite Encyclopedia Online. August 2010. Web. 24 Apr 2019. http://gameo.org/index.php?title=East_Swamp_Church_(Quakertown,_Pennsylvania,_USA)&oldid=139916. Fretz, J. Herbert. (August 2010). East Swamp Church (Quakertown, Pennsylvania, USA). Global Anabaptist Mennonite Encyclopedia Online. Retrieved 24 April 2019, from http://gameo.org/index.php?title=East_Swamp_Church_(Quakertown,_Pennsylvania,_USA)&oldid=139916. Adapted by permission of Herald Press, Harrisonburg, Virginia, from Mennonite Encyclopedia, Vol. 2, p. 129. All rights reserved.